With all of the unlicensed NES games that I still need to scratch off my list, I have very little desire to collect NES hacks. 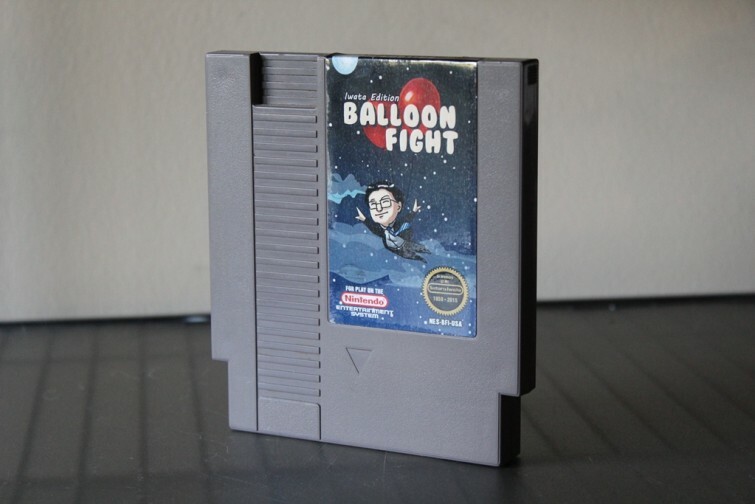 But when my friend John Riggs (of Rigg’d Games) released this ROM hack of Balloon Fight in memory of the great Satoru Iwata, I couldn’t pass that up. Iwata passed away in July due to issues with a tumor in his bile duct. The Japanese game developer joined HAL Laboratory in 1980. There, he contributed to great titles in the Earthbound and Kirby series, before eventually becoming the president of the company in 1993. He was soon hired by Nintendo, where he also worked with the Super Smash Brother and Pokemon series. His first commercially published game was Joust for the NES, which would later go on to inspire a game with similar game-play mechanics– Balloon Fight, released in 1984. The game features the sort of simple, fun and addictive gameplay that would eventually become a part of Iwata’s legacy. The hack featured in this post has the main character replaced with the uncanny likeness of My Iwata. But my favorite part is the beautiful cover art, which shows a blissfully joyful Iwata floating in the night sky with the help of two red balloons. All in all, the Balloon Fight (Iwata Edition) is fitting tribute to a creative genius. This cartridge does not count towards my NES collection total, which currently is 334. For the rest of the entries of NES Quest, check them out right here on Retro Chronicle.